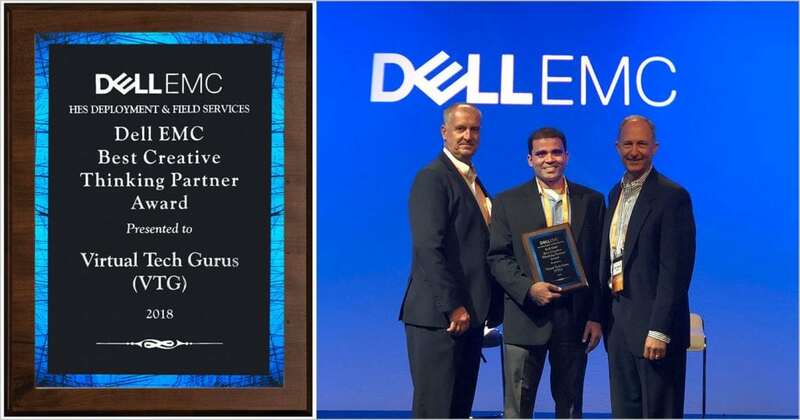 Addison, Texas – Dell EMC recognizes Virtual Tech Gurus, Inc (VTG) with the 2018 “Best Creative Thinking Partner” award for their impressive candor approach and dedication to continuously seeking improvement opportunities at an award ceremony of Dell’s Services partners in Austin, Texas on October 1st, 2018. ZENfra™ is one of those examples where VTG has spent a significant amount of time and resources to provide a tool that allows discovery, project tracking, planning, and electronic validation of a migration event. VTG received Dell’s Best Creative Thinking Partner award due to their innovation and implementation of their ZENfra™ solution, which allows Dell to be more accurate and organized. Project planning is typically ready up to six weeks faster with ZENfra™. The tool is very innovative and designed to significantly reduce human errors. It also results in much higher customer satisfaction rates for Dell clients. VTG, founded in 2008, is headquartered in Dallas, Texas with offices in the United States and India. VTG has core competencies in Cloud Services, Data Center Migration, Cloud Migration, Infrastructure Assessment and Staffing.